Principal harpsichord by Michael Cole after Joachim José Antunes (1785); also copy by Stephen Wessell of 2-manual English harpsichord and single-manual Rutgers by Andrew Garlick; 5-octave fortepiano similar to instrument of c.1745, two-manual organ in Barnsley Church, near Cirencester, Gloucestershire, UK, and two-manual organ of All Saints, Friern Barnet, London. NOTE: These sets cannot be played on a normal CD player. You will need one of the following: a computer; a portable MP3 device (like an iPod, but not limited to iPods) a DVD player; or the latest generation of in-car disc players. At the risk of putting the cart before the horse, I’ll comment on the format first. The recordings on this mp3 release contain 320 kb/s files – that’s the highest possible bit-rate for the format, though it involves a degree of compression by comparison with lossless files, of which more anon. Normally I wouldn’t recommend playing mp3 files direct from CD because of the short gap between tracks that even an mp3-compatible disc player inserts; that’s the case with the Hallé Götterdämmerung, for example, which should be copied to a hard drive and played from there, but in this case each track is discrete so, if your disc player will cope with mp3s, you won’t need to copy these recordings to your computer. Most modern players, even portable ones, will cope, but if you don’t own such a player, let me recommend the very versatile Cambridge Audio 650BD and its successor, the 651BD – equally adept with blu-ray, for which it’s primarily designed, SACD, DVD, CD and mp3. I listened to these recordings via a variety of systems – on my audio system using the Cambridge player, on TV using the DVD recorder, in car and on an mp3 player. Of these, of course, the mp3 player produces the least satisfactory sound because of the limitations of the on-ear ‘phones – they’re far better than the in-ear buds that come with most mp3 players but obviously limited. You wouldn’t want to sit down and listen to nothing but these sonatas for 41 hours on end, though the format is more varied than you might think and the use of different keyboard instruments makes for some variety. Most of the music is played on a copy of a 1785 Portuguese harpsichord – the sonatas were written for such an Iberian instrument, Scarlatti having been employed at the Portuguese and Spanish courts* – with alternative versions of some sonatas on the fortepiano or organ. Nevertheless, it would be very wise to take a disc at a time. The two organs employed both have a suitably ‘Iberian’ sound, but with the advantage that they are in tune, which is not always a given for the native products. The ‘nightingale’ stop employed at the opening of K328 sounded somewhat bizarre; Lester admits that he used it only because he liked it. Richard Lester’s approach to the music is predominantly scholarly, as is apparent from the information in the booklet notes, but he has also clearly concerned himself not just with matters of tuning and pitch – a variety of equal and non-equal temperaments are employed – but also with how Scarlatti intended the music to sound. The instruments employed are chosen from the latter viewpoint. There’s no doubt of Lester’s dexterity in playing these works, but the performances also bring out the individuality of the music, and, even more importantly, the extent to which he enjoys it. From our modern perspective, it may seem, as it did to Stravinsky listening to Vivaldi, that the same formula is employed 500+ times, but that’s the perspective of the onlooker who wonders how the shepherd recognises the individual characteristics of all his sheep. I can’t pretend to tell, say, K366 apart from K367 if I heard one of them played on the radio in the same way that I can (usually) tell you which Mozart piano concerto – or, even, Vivaldi work – I’m listening to, but there is variety in Lester’s performances. The continuo sonatas on the final CD are especially welcome in that respect; that disc also contains a work in similar vein by Scarlatti senior, Alessandro, and one by Handel. The recording is very close and with little stereo spread – I found the same to be true of the Frescobaldi recordings – but, in mitigation, the harpsichord is notoriously difficult to record; if it’s too distant the sound is apt to get lost, and the volume at which one plays the recording back is also critical. Too low a playback volume and there’s no power in the music; too high and it can be overwhelming. In this case I thought that the original Volume VII benefited from being played at rather less than normal volume and such is the case with these mp3 discs, too. On ‘phones in particular I had to reduce the normal listening volume very considerably to avoid being knocked out. In all modes, however, the sound is bright and clear and didn’t significantly limit my enjoyment. As for the mp3 compression, I didn’t find that it limited the sound to any noticeable degree. That’s not surprising because the same applies to Nimbus’s earlier mp3 release of Bach’s complete organ music and the Haydn symphonies, as also to the Halle mp3 Götterdämmerung, which also emanates from the Wyastone estate. You’ll find that I made detailed comparisons between some of the original CDs of the Bach and the mp3 versions and could hear little significant difference: NI5280 and NI5289 compared with the mp3 version on NI1721 – Bargain of the Month: review. Similarly, I compared the conventional 5-CD Götterdämmerung on CDHLD7525 with the mp3 version on CDHLM7530 – review. Mark Sealey, reviewing the original Volume V – here – from which the Trio Sonatas on CD9 are taken commented on the balance – the recorders are placed very forward, the harpsichord backward in comparison, and the acoustic sounds decidedly odd, but that’s the only significant problem which I found. The organ recordings are pretty well ideal, while the fortepiano has a dry sound – no doubt a realistic representation of how it sounded in vivo. In reviewing the 3-CD set on Volume VII of the original issues I complained of the sparsity of the information. The present release makes full amends with very adequate documentation. There’s extra information in pdf format and an Excel spreadsheet to supplement the full track listings in the booklet. There’s only one way in which these recordings could have been presented in more compact form and that’s by copying them to a USB memory stick, as Chandos have done with some of their releases. (Actually, Chandos offer both losssles, wma or flac to choice, as well as mp3 on their USB releases.) You can drag all nine CDs, including the pdf booklet and Excel spreadsheet, to a single 8GB USB stick if you’re looking to take up even less space. The price of £22, including p&p., direct from MusicWeb is one that you aren’t likely to match anywhere else, barring short-term special offers. It’s advertised as a notable bargain; I can certainly say that it qualifies as such without fear or favour and it’s far less expensive than buying just one of the constituent 6-CD sets even as a download. If the prospect of 41 hours of Domenico Scarlatti on the keyboard is too daunting, there’s a 2-CD distillation of 48 favourite sonatas from the series on Nimbus NI5822/3, £16 including p&p from MusicWeb – here. * Elaborately bound manuscript volumes of the sonatas were bequeathed to the Italian singer Farinelli and ended up in Venice, hence their designation as ‘Venice I-XV’. Continuo Sonatas, K78; K81, K88-91; George Frideric HANDEL Sonata in F, HWV405; Alessandro SCARLATTI Sinfonia in c minor – with Academia Musicali (Elizabeth Lester (treble recorder), Nerys Evans (descant recorder)). To start with, let me state that including a track list would be quite an undertaking. I’ll refer the reader to this Wikipedia page. It’s worth noting, however, that this set also includes a number of sonatas without K numbers from “existing and unpublished manuscripts,” in addition to the standard 555 that Ralph Kirkpatrick catalogued, as well as eight “continuo sonatas,” six by Scarlatti, one by Handel, and one by Alessandro Scarlatti. 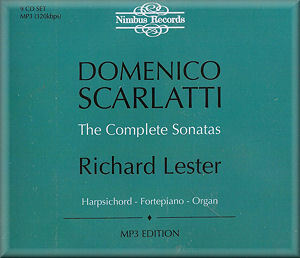 So here at last, in a super-bargain version is the full set of Richard Lester’s recordings of Scarlatti. Ever since Scott Ross’s monumental recording in 1984-5, for Radio France - later issued on 34 CDs by Erato - this has been one of the Everests of classical music. Few have recorded these works in their entirety; as far as I know, the only other complete set, beside Ross and Lester, is Peter-Jan Belder’s recent recording for Brilliant Classics, on 36 discs, released in 2008 (and recorded from 2000 to 2007). Carlos Grante is currently recording the complete sonatas on a Bösendorfer piano, which offers a unique sound for these works. A complete Naxos set on piano is also under way. It’s hard to imagine recording something as massive as this and still maintaining the necessary distance to truly give each sonata its due. When Scott Ross recorded the sonatas, it was over an 18-month period, in 98 recording sessions, he knew he was dying of AIDS. This must have been a herculean task, especially doing so in such a short time. Lester and Belder took, respectively, 6 and 8 years for their recordings. While I don’t own the Belder set, I do have Scott Ross’s recordings, and comparing the two, Ross comes out way ahead. While it’s fair to say that Ross may not have had the time to polish each sonata, the quality of the sound of the Erato recordings is so much better than that of these Nimbus recordings that, in spite of differences of interpretation, I would pick Ross’s set hands down. Lester’s instruments are miked very closely, and, in dipping into this set, I found some pieces that to my ears sounded very bad. Taking on example: K366, where the harpsichord sounds distorted; I’m not sure if this is from the compression or from the recording being simply too loud, and the sound being clipped. While you may enjoy the closeness of the recordings for certain of the works, those that distort are just unlistenable. It should be noted that the reviews of the original CD releases of these recordings on MusicWeb International don’t mention any issues with the sound, so it’s very possible that, aside from the close miking, the poor sound could be a result of the MP3 compression. The harpsichord is one of the hardest instruments to compress, because of the very complex overtones and harmonics at high frequencies. Also, there is no sense of stereo in the Lester recordings; they almost sound as though they were recorded in mono. On the other hand, Ross’s harpsichord sounds large and fills the soundscape delightfully. The handful of sonatas Lester recorded on fortepiano do sound fine; they almost make me wish he had done the entire set on that instrument. Given the annoying sound quality, I cannot recommend this set, even at its bargain price of £30. You can get the Scott Ross set for around £75, and the difference is certainly worth paying. Bear in mind that this music can be a bit mind-numbing. The sonatas are all in the same form, and generally sound pretty much alike, though Scarlatti was able to create 555 (or so) truly unique works. I find this music to be wonderful a disc at a time, but any more than that makes it all blur together. See also Patrick Waller’s review of Scott Ross’s recordings. I was so surprised that Kirk McElhearn had found the mp3 recording of these Scarlatti sonatas lacking in several respects that I listened to them again. I don’t own any of the individual sets that have just been reissued on NI1719, but I reviewed and enjoyed two volumes of Richard Lester’s Nimbus recordings of Frescobaldi and have frequently listened to some of his performances of Domenico Scarlatti from the Naxos Music Library. These have been available for some time now on 3-, 5- and 6-CD sets. For those who don’t listen to downloads or streamed music, which has become something of a speciality of mine in the last four years with the bi-monthly Download Roundups which I contribute – why not try the most recent, Download News 2012/19 – the Naxos Music Library offers streamed music from Naxos, its sister labels, and a number of other major and independent labels, including the whole Nimbus catalogue. Depending on your subscription, there’s a choice between ‘Near CD’ and ‘CD quality’, both in compressed (mp3) sound and, therefore, comparable with the mp3 files being offered by Nimbus on the new album. Before I get down to the nitty-gritty question of distortion, let me agree with Kirk on two points: you wouldn’t want to sit down and listen to nothing but these sonatas for 41 hours on end – that would be what he describes as ‘mind-numbing’ or worse, though the format is more varied than he implies and the use of different keyboard instruments makes for some variety. Most of the music is played on a 1785 harpsichord, with alternative versions of some sonatas on the fortepiano or organ. Nevertheless, Kirk is very wise to recommend taking one disc at a time. He’s also certainly right to say that the recording is very close and with little stereo spread – I found the same to be true of the Frescobaldi recordings – but, in mitigation, as I say above, the harpsichord is notoriously difficult to record; if it’s too distant the sound is apt to get lost, and the volume at which one plays the recording back is also critical. Too low a playback volume and there’s no power in the music; too high and it can be overwhelming. I listened particularly carefully to Volume 3/disc 5 which contains the sonatas K358 to K372 and includes K366 which Kirk found particularly problematic. All the works here are performed on the harpsichord and Richard Lester’s keyboard prestidigitation is apparent throughout. More to the point, he imparts a sense of individuality to each sonata and his interpretations are thoroughly musical as well as accomplished. K366, also known by its old Longo number L119, though not well known from various anthologies of Scarlatti’s sonatas, would serve well as a typical example of the style and it receives a very impressive performance. It’s certainly also typical of the recording quality of the whole of that disc in that it sounds pretty up-front and with limited aural spread. I didn’t, however, hear any distortion on either of my audio systems, though they have quite different characteristics, one much warmer, the other considerably brighter. I also listened on ‘phones – both my larger Sennheisers and the smaller over-ear clip-ons that I use with my mp3 player on the rare occasions when I bother with it. On ’phones I had to reduce the normal listening volume very considerably to avoid being knocked out. In all modes, however, the sound is bright and clear and didn’t significantly limit my enjoyment. How come the discrepancy between my experience and Kirk McElhearn’s? I’m certainly not a sound engineer – not even a scientist, with degrees in the arts and literature – but I have noticed that some recordings sound much better on some systems than others. I recently listened to a programme of music for flute, harp and viola at low volume late at night and thought it well recorded; next day, on my other system at a higher volume, it sounded too close. Even stranger; in an effort to get the Parry revival en route I downloaded the Hyperion recording of Job in lossless sound and burned it to CD. I was so surprised to hear the voices sounding undernourished by comparison with the orchestra that I listened on the same system directly from my computer and – you’ve guessed it – the balance was just right. Don’t ask me why. It may well be, then, that some systems simply won’t like the very bright up-front sound of these recordings. If you worry that your system may be one such, try listening via the Naxos Music Library if you can; it’s a very worthwhile investment to take out a subscription. Otherwise, classicsonline.com will allow you to sample 30 seconds from each track – you’ll find Volume 3, with K366, here. If, however, your experience is in any way similar to mine, you won’t hear aught amiss and can buy with confidence. I have listened to K366, which was specifically mentioned in the review as exhibiting 'distortion'. I don't hear any distortion either on the original WAV masters or the MP3 file. I can agree that the recording of this sonata is close miked but there is no 'clipping' on the original recording, and I do not hear any artifacts that might be a function of the MP3 compression. It has been our experience that no listeners have been able to identify any of our Nimbus MP3 Editions from their original CDs with any degree of accuracy or consistency. In practise they sound identical. The Scarlatti in particular offers huge value and we are happy to extend a 'No Risk' return policy to MusicWeb customers. So if you are unfortunate enough to experience distortion return your discs and a covering letter to Adrian Farmer, Nimbus, Wyastone Leys, Monmouth, NP25 3SR, UK and e-mail Len Mullenger to ask for a refund. Having already read the erudite essays on these recordings by Brian Wilson and Kirk McElhearn, I will just confine myself to a few additional thoughts and comments. This is a very valuable and scholarly achievement. To have the complete Scarlatti sonatas together, here following the chronology of Queen Maria Barbara’s manuscripts, is like having a dictionary or encyclopedia for reference purposes. So this is like a reference library for these works, especially for those who are studying Scarlatti for musicological or performance purposes. I will certainly find them very handy. But part of the skill of the Scarlatti player is to select from this vast output a group of diverse pieces to entertain his audience. So if I were to listen to Scarlatti for pure enjoyment and pleasure, I would not play one of these discs necessarily in the order presented here. I would prefer to hear a judicious selection made by a performer for his recital. Having said that, I have noticed that Richard Lester is very skilled in presenting very similar pieces in a variety of articulations and tempi. So for example, K249 and K250 are both marked to be played Allegro. The former in B flat major is lively and dramatic and I particularly like his attack on the chords at the beginning of sections. K250 in C major sets the right mood at a convincing tempo, a little slower than K249. So variety in performance and mood can be achieved in these works when presenting them chronologically. I wonder if Richard Lester would play them in the same way if he were giving a concert of selections. I enjoyed these discs very much. Disc 1 sets off at a cracking pace with No. 1 in D minor in which the performer’s effective use of vibrato is very convincing. K2 is in happier mood and K3 is a fabulous piece with some unexpected turns of phrase. Lester gives K19 some beautifully clear ornamentation and a very exciting performance it is too. K29 is fast and furious and K30 is marked Moderato, although Lester moves along quite quickly in this rather more contrapuntal piece. Occasionally some sonatas sounded a bit too scholarly. I thought K388 in G was a bit laboured. I fear that K271 is an example of the pulse slowing down a touch when Lester indulges in some elaborate ornamentation. But these minor niggles are few and far between. In K3I6 in F a good, steady tempo is maintained throughout, thus allowing the triplet semiquavers to speak crisply and clearly. K317 is firmly and solidly played and K322, again marked Allegro, is played at a more moderate tempo showing us how this mood and tempo indication can be interpreted in a myriad of ways. There is certainly plenty of variety in these Essercizi K1-30 to allow the performer to demonstrate his musicality and inventiveness. Variety is also achieved in this recording with Richard Lester's use of several instruments. For example K415 is played firstly on harpsichord then on fortepiano. Certainly it sounds correct that the harpsichord version is a little faster, and I found the harpsichord more convincing in this piece. Maybe I just have a bit of an aversion to the fortepiano! I really enjoyed K58 and K93 played on an eighteenth century organ in Barnsley Church near Cirencester. I also liked the Continuo Sonatas on Disc 9 played on descant or treble recorder with harpsichord, though it might have been better to have had a couple of them with violin as solo instrument as a contrast. I agree with Brian Wilson that the best way to record the harpsichord is to have the microphones pretty close and then lower the volume as necessary. My own harpsichord is in the same room as the hifi and the close sound is remarkably similar on the harpsichords, live or recorded. I listened very hard for the distortion mentioned and I played the discs on two different sets of equipment but I could not hear any distortion at all. I particularly listened to K366 which Kirk McElhearn found so offensive, but I found the recordings to be very good indeed. This is a really excellent collection and well-worth the small financial outlay even if it only remains on your shelf as a reference work or for playing the occasional selection for pleasure. The scholarly booklet is also very valuable.